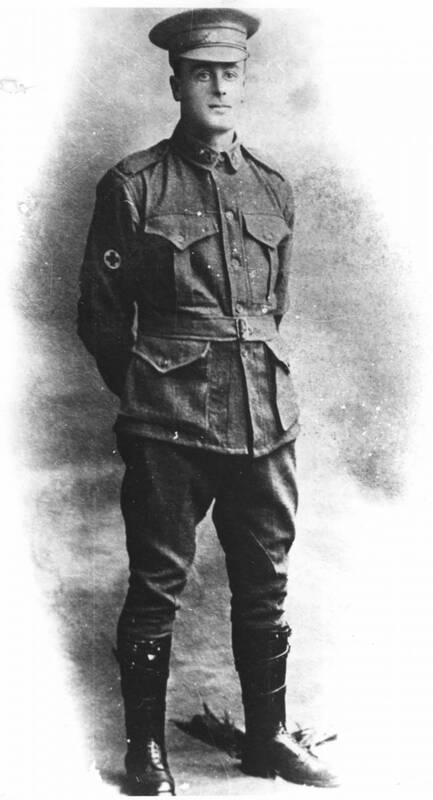 The son of Albert Edward Wilson and grandson of John Bowman Wilson, ‘Bert’ Wilson enlisted and after three months of basic training in Australia then a further three months in England of specialised medical corp training he was assigned to the 10th Field Ambulance, AIF in 1916 and thereafter served out the balance of the war on active service in France. In September 1917 he was hospitalised after a gas attack for some 5 months, then rejoined his unit in France. The detailed military records for Albert, record all his postings from the time he enlisted in 1916, sailed to England, all his postings in France (from 30/11/1916 to 27/5/1919) including Rouen (at various times he was also stationed at Dieppe, Le Havre, and at Saint Omer in Normandie), his Leave, his illnesses, his wounding with shrapnel (19/9/1917). On return to England in 1819 his location was at army encampments at Sutton Veny and at Fovant near Salisbury. In London after the war he married Jeanne Vangraschepe, a lovely French girl from near Rouen in Normandie. On 22/9/1919 he was granted ‘Indefinite leave whilst awaiting a Family Ship’. They embarked on board Troop Ship ‘Benalla’ 8/10/1919 for Australia and thereafter lived in the Frankston area. Bert became a linesman with the Post Masters Generals Department (PMG) which at that time looked after postal and telecommunications services in Australia. Bert suffered continually from the effects of the poison gas for the rest of his life. In our ‘Stories’ section we have a memorable childhood story (‘The Rabbit Skins’) from our cousin Mike Wilson about the uncles he never met, Bert and his brother Charlie and their cousin Frederick Ernest Wilson – all rememberd in stories on this mainpage. Regrettably Charlie lost his life in what might only be described as thoughtless, wasteful and cruel circumstances.